I’ve tried dozens of coffee brands, bought a burr grinder to grind whole beans, and I still can’t find a blend that’s not overroasted. So the gentle and sweet magic that cold press promises is super appealing to me. To keep things as scientific as possible and also because THIS IS SPARTA TYPE-A I brewed the coffee each time in my French press with the same amount of coffee and water, and the same batch of freshly ground coffee. You prepare cold brew the night before by adding coffee grounds to your French press, fill with lukewarm water, and let sit in the fridge till morning, then plunge and proceed. For coffee served hot, I like cold brew reheated. The cold brewing removed all the rough edges and left me with a mellow cup of sleep-in, vs. that KAPOW LET’S MOVE IT MOVE IT cup Monday needs. The downside is that if I want more than one pot of coffee I’ll need to think about all of this in advance and own more than one French press. So. Now we have to buy more French presses. Are you with me? Cold food needs to be seasoned more to counteract the cold, so all the gentle nuances of cold brew get lost. I wouldn’t kick cold brew served cold out of bed for eating cookies but it doesn’t hold a candle to hot brew served cold. Good grief that’s a lot of metaphors. 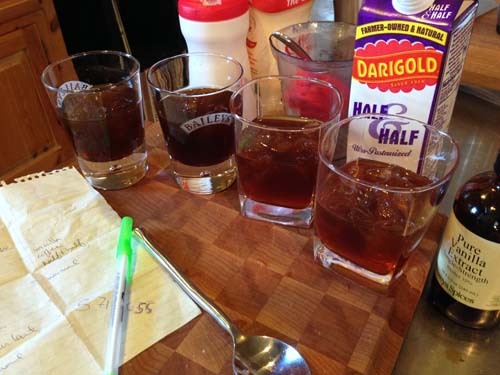 Okay, bottom line: Cold coffee needs the sharp notes and bitter flavor that cold brew removes. If you’ve got a lazy Sunday morning ahead of you, mix up a carafe and put it in the fridge overnight, then microwave in the morning (don’t boil it). 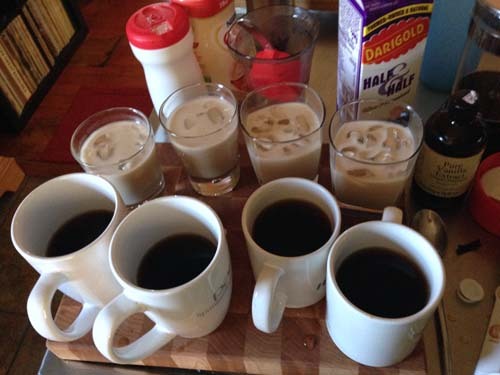 For your iced afternoon pick-me-up, however, use the leftovers from your morning hot brew because for iced, stronger will definitely be better. Go forth and be caffeinated!